Most websites are controlled by a Web Hosting Company or Internet Service Provider (ISP). The fact is that most companies never bother to notify you when your web site is responding slowly or failing completely to respond. If your website is down or slow that can quickly cost you revenue and a loss of valuable visitors. Most Web Hosting companies "claim" a 99% or better "Up-Time", but many do not deliver and often respond slowly to browser requests several times each day. Poor performance from a company that is hosting your web site ultimately will reflect on you, which inevitably will lead to a loss of visitors and income if you have an internet based business. Unfortunately most website owners are completely unaware of problems that often occur daily with their websites. This makes Monitor a very valuable tool in measuring the performance and response of any website URL. DNS monitoring to verify IP address resolution. HTTP monitoring to insure your website is visible to the public. When a website address is pinged the Web Host Internet Provider (IP) sends a response code. Monitor Wolf will actively ping the IP address and automatically interpret and measure the response, analyze the results, and plot response trends over time so you can track the performance of the website. Ping response is analyzed instantaneously. All results are compared and analyzed as they occur so you can monitor the website response in "real time". If a ping is not responded to on the first try, Monitor Wolf will try again to verify the ping failure. "Pinging" an address is the only truly accurate way to measure a websites response. The ping response is the same type of response a visitor would receive from a web browser request, so Monitor Wolf measures it and interprets it automatically for you. This data is then used over time to determine the overall performance of a website. It is recommended that a website be monitored for at least 30 days and 1000+ ping responses before coming to a conclusion on a websites overall performance. Measuring a websites performance and comparing it to other Web Hosting company websites is often a good way of making a determination if you might want to consider a change to a different provider. 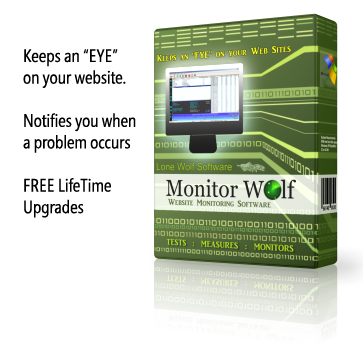 Monitor Wolf was designed to be easy and intuitive to use. Although the application performs some very complicated processes, it is all performed in the background and the results displayed for you in an easy to read and understandable manner. Click on the NET toolbar button to add a website URL address to monitor . Test DNS - Checks the DNS and lets you know if the domain name is resolving correctly to the servers IP address. If the DNS fails nobody will find your website. Test HTTP - Checks the actual HTML code on the homepage to verify that it's visible to browser requests. If the code is not visible to the internet then your website cannot be accessed. Alarm Notification Option : enable if you want to have an alarm wav audio file played when a monitored site fails to respond. Click the wav button to select any wav file (audio file) on your computer. Click the Test button to test the wav file selected. Email Notification Option : enable if you want to be notified by email when a monitored site fails to respond. A notification may be sent to any email address. Email address of recipient - enter the email address where the message will be sent. Subject line of email message - enter the subject line that you want displayed for the email message. Email message (body) to send - enter the actual message that you want to send (the date and time of failure will automatically be added to the message. 3) UNCHECK the option that says "Warn me when other applications try to send mail as me"
A tool to help you lookup the IP address for the web site being monitored. Monitor Wolf uses a "Base response time" from a "Control web site" to use as a scale to measure if your internet connection is performing adequately before testing the web sites you are monitoring. We recommend using a web site address that responds consistently like Yahoo or Google as the "Control". The Base response time will be tested at specified intervals to insure that your response results for any monitored sites are accurate and unskewed by a poor internet connection. If the Base response time of the Control site deviates from the average response time by more than the specified amount, all web site monitoring will be temporarily postponed until the connection returns to normal. The average response time for the Control site is calculated in the first 15 seconds after starting the program for a monitoring session. Set Control Web Site : The web site to use as the "control" response to check if your internet connection is responding normally. We recommend using a stable site like Yahoo or Google. Test Site Button : If you change the control web site the Test Site button must be selected to test the site response before the change can be accepted. Test response of control web site value : A value (in minutes) that determines how often Monitor Wolf will check your internet connection . Temporarily stop monitoring all sites value : A value (percentage) that determines the magnitude of the deviation in response from the "control web site" that is allowed before monitoring is suspended. Example - If your deviation percentage is 100 and the "control web site" response was 50 ms when tested, then monitoring will be suspended if the "control web site" response increases to 100 ms.
Monitor Wolf incorporates a WHOIS processor to allow you to check the ownership information for most websites. The Domain Name Server (DNS) addresses associated with the website displayed in the WHOIS results can also be entered into Monitor Wolf. The results for each website being monitored can be displayed by clicking on the website in the list of monitored sites. All performance results are analyzed, updated and displayed in the Results window after each Ping in "real time". The Website Overall Performance (WOP) is displayed in the top right corner of the results window under the "performance" heading. The WOP result is determined using three important response parameters - Ave response time , slow response percentage, and Up-time percentage. The 3 parameters are weighed equally in the final WOP calculation. A perfect website performance would yield a final WOP value of 100. NOTE: The confidence in the WOP rating is indicated by the color of the WOP that is displayed. A green WOP rating indicates high confidence, a yellow WOP rating moderate, while a red WOP rating indicates poor confidence. The WOP confidence is based on the total result count and time range for the monitored website. A green WOP rating requires at least 1000 results over a 30 day monitoring period. So when you see a green WOP rating displayed you can be confident in the final website overall performance result. All results are displayed in the Response graph at the bottom of the Monitor Wolf window. The graph is updated in "real time" as each result is received. The graph is useful to illustrate response trends. A slow response is easily distinguishable as a peak in the graph. An occasional slow response (peak) is normal and insignificant, but a response graph with a substantial amount of peaks is an indicator of a website that has a tendency to respond slowly to browser requests which can be a concern for losing visitors. A graph with extended peaks indicates periods of slow response... a major problem! Generally you want to see a fairly flat response graph that's below 50 ms. Example of erratic response results from a monitored web site : This site will often respond slowly to browser requests. Example of Good response data : This site will respond quickly and consistently to browser requests. Monitor Wolf's measurements and calculations are extremely accurate and it's an excellent tool for analyzing a websites performance. However, any analytical tool requires sufficient data to be able to converge to a "good" conclusion. "Sufficient data" requires at least 1000 response results compiled over a minimum of 30 days. This will allow for a high confidence rating in the final performance result. We also recommend that several websites be monitored to allow for comparisons before making a decision on whether a particular website/web hosting company is providing fast, reliable service.